There is a tendency among many karateka today to find grappling applications (bunkai) in their kata. That is fine. 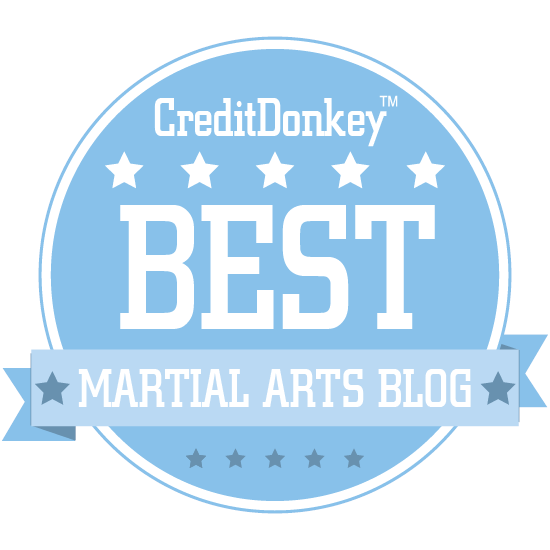 Yes, karate is (undeniably) a "stand up" fighting art, first and foremost, but it also has grappling applications. My only problem with grappling interpretations of kata arises when the bunkai strays into "kata has comprehensive, built-in BJJ applications!'" territory. Let's make this simple, shall we? Karate and other traditional civilian defence arts are not, and never have been, grappling arts - at least not in the same sense as judo, jujutsu or Greco-Roman wrestling. If they were, they wouldn't involve quite so many solo "kata", so many obvious punches, kicks, strikes and "blocks". They would mostly revolve around... grappling! With a partner! Okay, so arts like karate do have some grappling. How is this grappling different, if at all, from that found in dedicated grappling arts? Traditional civilian defence arts try to control the melee range and keep you out of the grappling range. Just ask your average bouncer at a pub or nightclub: "Who loses when someone goes to the ground?" The answer is, generally: "The guy on the ground." This is because, unlike the ring, you don't have the same level of predictability in your environment. There are a multitude of potential variables that cannot be controlled while you are entangled with one person, ranging from multiple attackers, weapons, problems with obstacles and uneven, difficult terrain, moving vehicles, etc. As I've said recently, neither attacker nor defender wants a long, drawn-out "fight" in a true civilian defence encounter (and I'm excluding young men having a "dominance settling display" from my definition of "civilian defence"). Why? Because it is in neither side's interest to take these unknown variables for granted. The longer you do so, the greater the chances of these variables impacting negatively on you. What are the most likely variables with which you might have to contend if you are caught with one opponent on the ground? Obviously the most pressing concern is your attacker's accomplices. Is this a real concern? You bet! As a prosecutor I can honestly say I saw very few civilian defence situations that looked "one-on-one" - and even fewer with a "BJJ flavour". So yes, that case was "one-on-one". 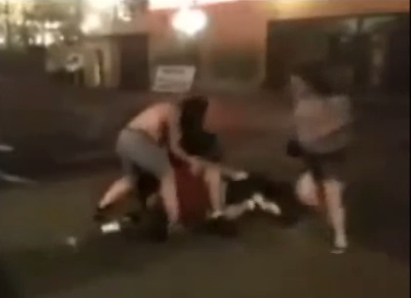 The rest either ended with one person "going to the the ground" because they were knocked unconscious, or rapidly became "2 or more-on-one", especially when the initial attacker found him or herself in trouble. In the above video I actually include footage of people coming to the aid of downed fighters (in one case, one is the mother of one of the protagonists!). 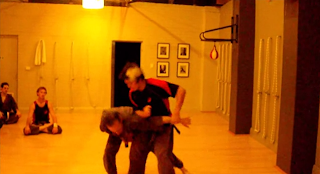 in grappling range just means I can take Rob down. 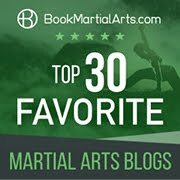 So what do traditional civilian defence grappling methods teach that is so different to those used in judo/jujutsu and other true grappling disiplines? They teach you to keep a kind of "bubble" between you and your opponent - a gap that is sufficient for you to remain in the melee range even when you are engaged in grappling. 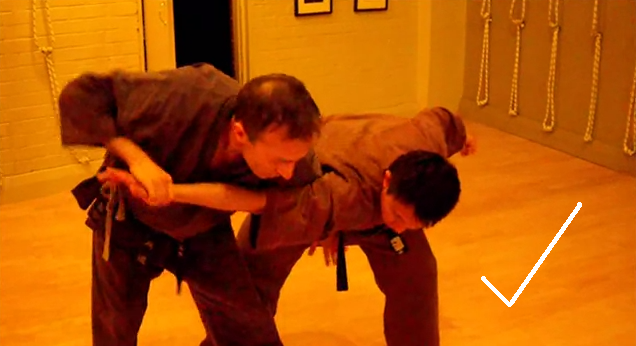 A good example is the standard "arm bar": this technique is often applied by karateka and other traditional martial artists around the world without a single thought as to the prospect that it might place you in danger of being "taken down". 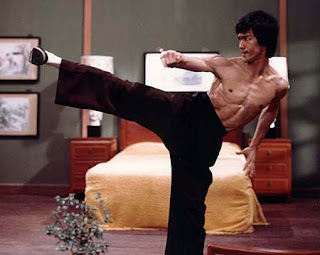 There is an underlying assumption that the other fighter "will fight like the guys I'm used to fighting in the dojo". In my video above I show how easy it is for someone to whom an arm bar is being applied to simply shoot your legs and take you down in an instant. The "arm bar move" in shichochin kata is accompanied by measures to keep your opponent both at a suitable distance and off-balance so that he/she can't dive into the grappling range (see the photo at the start of this article). In this case, the kata shoots your leg forward as you do the arm bar. And it does so for a very good reason: it hooks behind your opponent's leg while you're applying the arm bar and pushing your opponent sideways. These measures, working together, keep the attacker both in the melee range and slightly off balance (to prevent them diving into grappling range). It is in this sort of way that most traditional civilian defence arts show a clear tactical to bias towards avoiding going down to the ground at all costs. Their applications are specifically geared to staying in the melee range and not going one step further to enter the grappling range - or allowing your attacker to do so. This aspect of traditional fighting methodology is however something I rarely see considered, never mind highlighted, in modern interpretations of karate bunkai. All too often I see something like the adjacent images of a purported "application" of gedan uke. Sure, this "application" seems to work fine in the dojo. 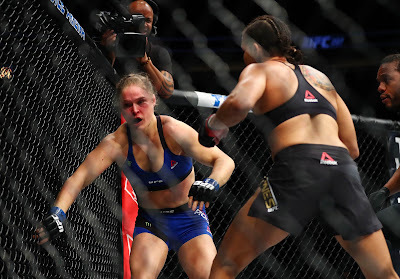 But it completely ignores the reality of how an untrained fighter - never mind a trained grappler - will clinch: ie. move into the grappling range and grab. From there, there is a universal tendency to stifle the blows further by going to the ground and wrestling. It is a defensive reflex - especially for those who don't feel safe in the melee range, trading blows. In this sense, grapplers are in some senses correct when they say "90% of fights go to the ground". While this might not be literally true in terms of civilian defence statistics, it does describe the reality that if a fight goes on for any length of time, there is high probability that one person will clinch the other - if for no other reason than to negate the effect of blows - and then both will fall to the ground. When that happens in a serious civilian defence context (as opposed to a schoolyard or other similar scuffle) you are exposed to the risk of being pinned down with that attacker. And this increases your overall level of risk significantly. 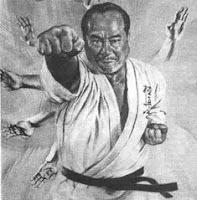 So whenever you are examining purported karate "bunkai" ask yourself this very simple question: does it meet the "grappling range avoidance test"? Because civilian defence arts like karate are not grappling arts, per se. They avoid full grappling. This is inherent even in their "grappling" techniques. They are designed to be effected in the melee range - ie. at a slight distance; not in the full "hip to hip and cheek to cheek" grappling range. None of this should be taken as a suggestion by me that you "shouldn't learn grappling" or that you "don't need to learn grappling". 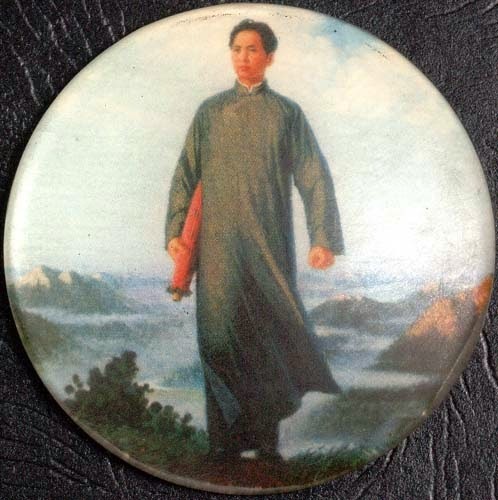 I'm simply stating the obvious: arts like karate are not grappling arts and their applications have to be understood in the context that they are geared at avoiding full ground grappling - not entering into it (or even entertaining the possibility to any appreciable extent). Yes, by all means, you should learn how to grapple: it is a very useful skill. There are many situations where you might need to use grappling skills. My brother chose to choke out a burglar rather than strike him, for instance. And to some extent, karate and other similar "stand up" arts do have such techniques here and there (with the appropriate set-up). But to go further and maintain that such arts are therefore "grappling arts in disguise" is not only foolish; it is irresponsible. Why? Not only because it instills a false sense of confidence in grappling ability, but also because it derails the very essence of traditional civilian defence systems: their ability to control the melee range and keep you out of the grappling range. I liken many of the grappling "bunkai" of karate online as "faux BJJ" - analogous to "faux boxing". It doesn't stack up against the real thing! And if you persist with "faux BJJ", you'll be trading skills that actually work for those that don't! No, what karate and other traditional civilian defence arts have is not an expertise in "grappling"; rather they have an expertise in "not grappling". And it is precisely this expertise that is so often ignored and diluted by those wishing to press traditional stand-up arts into a "BJJ mould". Going under reduces your chances of being taken down. "A grappler can teach you everything you need to know about staying on your feet". Yes, a grappler can teach you a lot of stuff about avoiding going to the ground. But you have to remember that this is all from the grappler's perspective. Largely, what a grappler can teach you is what a grappler would do - and that's a very handy thing to know. However if you've ever fought grapplers, you will note that they will take every opportunity to get into, and stay in, the grappling range. The civilian defence practitioner wants the very opposite. 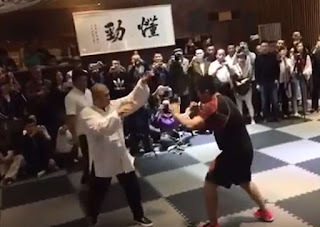 My own experience and research, especially in recent years, is that traditional arts like karate are absolutely full of effective tactics suitable to this task - and these are no "poor cousins" to the "anti-grappling" measures of a specialist grappler. Consider for a moment if you wanted to learn how to avoid a hip throw. You could go to a judo player and have them teach you a counter. But what would you be learning? A grappler's counter! If you're not good at grappling, this will probably be of very little use to you - especially if the confrontation continues: you'll be either on the ground or, at best, still in the standing grappling range. 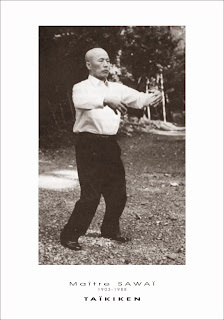 An example of how a civilian defence art (in this case, taijiquan by Su Dong Chen) thwarts a hip throw. As you can see it has very little to do with how a judo player would do it. 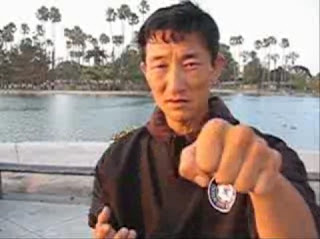 The first thing Master Su does is stifle the grappling entry by jamming the incoming foot - keeping the attacker in the melee range. He then employs a melee range throw or projection - not a judo counter throw. I think the fact that many traditional "stand-up" practitioners don't know any such tactics from their forms (or can't execute them properly) isn't because they aren't there. 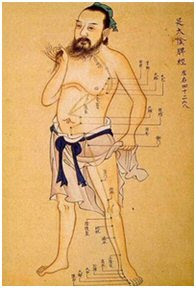 Rather, it is because the practitioners consciously or subconsciously end up "playing the grappler's game" - at least to some extent. This is probably because in the dojo they know that if they're grabbed, no harm will come of the situation, so they become nonchalant about going down. Furthermore I'm fairly sure that today they are also influenced by umpteen "judo/jujutsu-style grappling applications" of kata. These are often preferred as "advanced" over tactics that would keep you in the melee range and out of grappling range. Regardless, in my view this is not what civilian defence arts are all about.